Mybeginning123.com is the PUP that uses misleading techniques to prevent removal. Use Reimage to locate malicious components and get rid of them faster than with uninstall instructions. A full system scan blocks virus reappearance and prevents traffic to malicious domains. 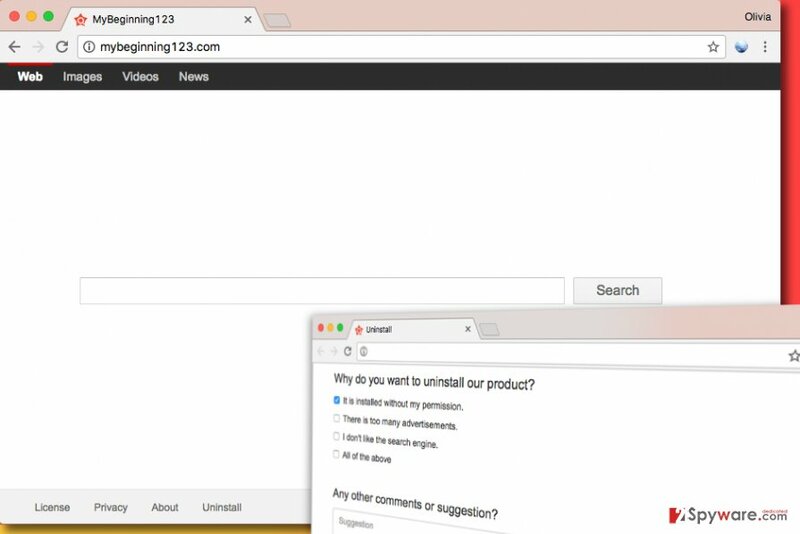 Mybeginning123.com virus is a computer program that aims to change browser settings in Chrome, Mozilla and other popular web browsers. Once installed, Mybeginning123 can modify browser shortcuts, add unknown programs or browser extensions to the system and start collecting information about user’s browsing preferences and general interests. What is more, the virus starts redirecting to hxxp://mybeginning123.com page, which contains a search engine. This search engine is judged by cybersecurity experts because it functions as a tool for revenue making instead of being a beneficial web search service. It seems that the majority of results it provides points users to affiliate websites instead of ones that are associated with user’s search query. 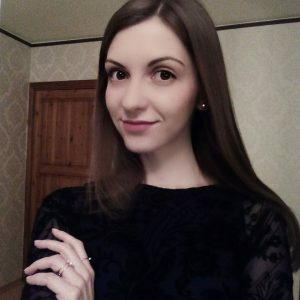 Besides being completely useless, this hijacker is also distributed using shady techniques, which makes us put this program to potentially unwanted programs’ (PUPs) list. However, even if this program seems to be quite bad, it actually is a legitimate application, and technically it cannot be called a virus. However, its annoying behavior has earned it this title. Besides, the fact that very similar hijackers such as StartPageing123.com, Myluckypage123.com, Myluckysurfing.com or Launchpage.org fall into most aggressive browser hijackers of 2017 lists should encourage you to remove Mybeginning123.com without a wait. According to research, the described hijacker can affect PC and Mac users. After installing it, users shortly discover that it appears in almost all web browsers after opening them or a new tab in them. It is so because this hijacker sets the aforementioned URL as default homepage and new tab page address. On top of that, it might also assign this value to “default search” setting. The website that gets promoted suggests using a shady Mybeginning123 search engine, which provides many sponsored search results instead of suggesting more organic ones. Therefore, while looking for important information online, the user might get redirected to sites that he/she never wanted to visit. It is important to note that these websites are not monitored or controlled by the developer of the hijacker and the search engine, and they can be dangerous to visit. However, the author of the search engine says that it is not responsible for privacy practices of such other sites, and “encourages [the user] to read the privacy statements of each and every website.” Everybody knowns that it almost never happens in practical situations because reading these documents takes a lot of time. The most worrisome thing Mybeginning123 hijacker does is that it silently installs tracking cookies into user’s browser and starts collecting user’s search queries, the list of visited websites, observing how much time one spends on certain websites and even more. All collected data can be used for selection of targeted ads, which might get integrated into search results. As we said, clicking on them can take you to quite dangerous web pages. This is yet another reason why we recommend you to remove Mybeginning123.com straight away. Mybeginning123.com virus sneaks into computer system unnoticed and aims to transmit various third-party content to the user because it gets paid to do so. Ads might appear within search results or in pop-up windows. Users who want to protect their PCs from browser hijackers should carefully install free programs they download from the Internet. These programs usually offer to install a couple of free additions alongside them, and it is up to the user whether he/she wants to get them or not. Contrary to a popular belief, “Standard” or “Default” software installation settings aren’t the trustworthy ones. Users should always swap these options with “Custom” or “Advanced” ones because these will provide the possibility to alter bundled software that came with the main program. The user gets the right to drop off unwanted components, meanwhile suggested default installation settings usually never notify the user about their existence. When dealing with a program that promotes this hijacker, users should encounter suggestions to “set Mybeginning123 as home and new tab page in web browsers.” After deselecting such suggestions, the user should proceed to the next software installation step and be attentive to every detail provided by the installer. You can remove Mybeginning123.com virus without using any additional programs if you follow these uninstall instructions carefully. Of course, an even easier way to get rid of this hijacker is to use an anti-spyware or anti-malware program. We must point out that some antivirus programs might not be capable of deleting this browser hijacker because such programs typically target more critical viruses such as ransomware or Trojans. However, it won’t hurt to run a system scan with one if you have it on your PC already. Make sure it is up-to-date before you try to carry out Mybeginning123.com removal with it! In order to remove Mybeginning123 hijacker, uninstall all suspicious-looking programs via Control Panel as explained below. Make sure you clean those web browser shortcuts afterward. Here, look for Mybeginning123.com or any other recently installed suspicious programs. Search your Mac for shady apps using the instructions provided in this tutorial. Wait until you see Applications folder and look for Mybeginning123.com or any other suspicious programs on it. Now right click on every of such entries and select Move to Trash. When in the new window, check Delete personal settings and select Reset again to complete Mybeginning123.com removal. Once these steps are finished, Mybeginning123.com should be removed from your Microsoft Edge browser. Here, select Mybeginning123.com and other questionable plugins. Click Remove to delete these entries. Now you will see Reset Firefox to its default state message with Reset Firefox button. Click this button for several times and complete Mybeginning123.com removal. Chrome gets hijacked quite easily, so you should definitely check this browser for suspicious extensions that may have been added during Mybeginning123 attack. Here, select Mybeginning123.com and other malicious plugins and select trash icon to delete these entries. Click Reset to confirm this action and complete Mybeginning123.com removal. Here, select Extensions and look for Mybeginning123.com or other suspicious entries. Click on the Uninstall button to get rid each of them. Here, look at the Homepage field. If it was altered by Mybeginning123.com, remove unwanted link and enter the one that you want to use for your searches. Remember to include the "http://" before typing in the address of the page. Now you will see a detailed dialog window filled with reset options. All of those options are usually checked, but you can specify which of them you want to reset. Click the Reset button to complete Mybeginning123.com removal process. ^ Definition of 'Computer Virus'. Economic Times. India's Leading Business Newspaper. ^ The most dangerous browser hijackers of February. Virus Activity News. Latest News about Malware Activity and Trends. ^ Watch out for the latest in browser hijackers – Qtipr.com, Motious.com and Launchpage.org. eSolutions Blog. Company News, Information about Latest Cyber Threats. ^ Steve Ranger. Ransomware is now so awful it's actually making us take security seriously. ZDNet. Technology News, Analysis, Comments and Product Reviews. This entry was posted on 2017-04-25 at 03:07 and is filed under Stealing programs, Viruses. You can quickly scan the QR code with your mobile device and have Mybeginning123.com virus manual removal instructions right in your pocket. How did you remove Mybeginning123.com virus?